Sweet, succulent and soft dough balls, dipped in sugar syrup. Whether you serve these delicious Gulab Jamun as a dessert at parties or simply want to indulge yourself, this traditional asian sweet is a must-have for anyone who has a sweet tooth. 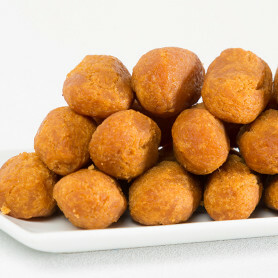 The Gulab Jamuns are carefully blended from precise proportions of milk and flour, then the rich dough is shaped into cylinder shape and cooked in pure clarified butter (Ghee) to give it an extraordinarily delicate texture. The final touch is wickedly sweet sugar syrup that smothers each Gulab Jamun in an irresistibly tempting and aromatic coating.